Have bats invaded your home recently? Bat’s in attics can not only be nuisances for homeowners, but they can also be potentially dangerous as well. If you have finally had enough of these pests in your Andover, MN home, pick up the phone and give Minnesota Wild Animal Management Inc. a call today. We’ll be happy to work with you to get rid of the bats humanely and ensure you don’t have to worry about bats for a long, long time! Bats are nocturnal animals meaning that they sleep during the day and are active at night. This can be a nightmare at home when you are just settling down for the night and begin to hear noisy bats moving around in your attic or chimney. Bats typically like to make their homes in chimneys or attics and make their way into structures through holes in siding, soffit, fascia or vents. If you notice holes in any of these areas you may be dealing with a bat infestation and should consult a wildlife removal expert immediately. Getting rid of bats in your home isn’t something that should be handled on your own. 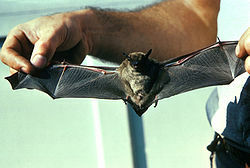 Removing bats in attics is a complicated process and one that should be only handled by bat removal experts. You don’t want to be left with dead bats in your walls or attic, which can cause a severe sanitation problem in and around your home. At Minnesota Wild Animal Management, Inc. we’ve performed hundreds of bat exclusion jobs for our clients. We not only get rid of the bats humanely, but we also clean up and sanitize the areas where their nests were located and perform preventative repairs to ensure the bats will not return. Preventing bats from returning involves sealing up all possible entry points around your home to ensure bats do not re-enter your home after the bat removal is complete. To learn more about getting rid of bats from your home or commercial property, don’t hesitate to contact Minnesota Wild Animal Management, Inc. today be phone at 612-237-8282 or through our online contact form. We’re available 24/7 to handle all your wildlife removal emergencies. We look forward to helping you get rid of bats and other wildlife that may have been causing problems for you for far too long!